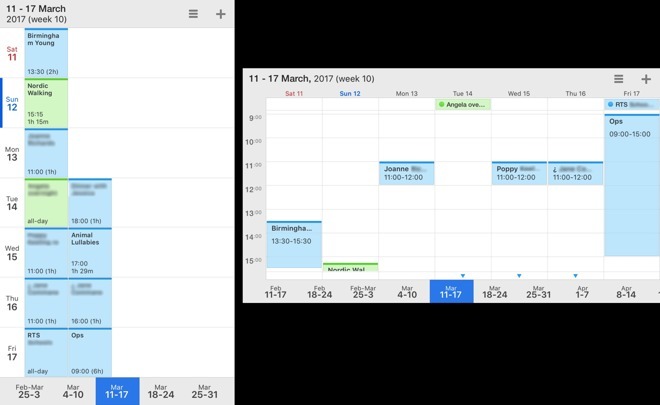 All Calendars 5 lacks for the Apple faithful is a Mac version —AppleInsider schedules some meetings to see if that's an issue or not. Apple's own Calendar often gets derided, but chiefly because if everyone admitted it was good, you'd never look at anything else. Nonetheless, it is genuinely beaten by a range of calendar apps that each offer certain benefits. Calendars 5 by Readdle goes for offering you power features and as simple, minimalist design as it can. Amongst the best-featured calendars for iPhone and iPad, Calendars 5 is very close to the cheapest. If you're really judging on price, go download any of the thousands of free ones on the App Store —you'll be back. You'll be back because of its design. Calendars 5 has a particularly clean look to it and also uses your screen well regardless of size. 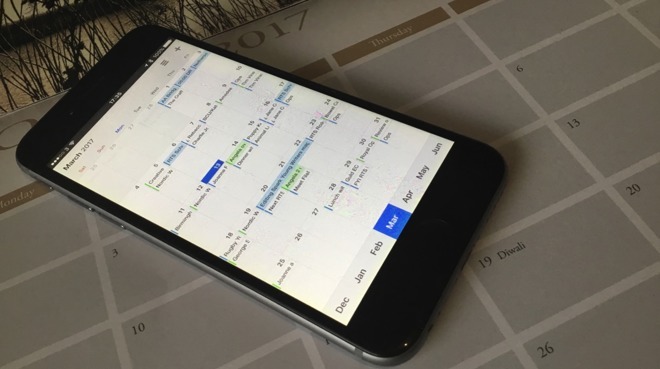 For example, if you look at your week on your iPhone in regular portrait view, Calendars 5 is the only app we've seen that usefully crams in all your appointments. Say you've got a meeting at 9am and another at 5pm. In every other calendar, you would have to scroll to see both of them. In Calendars 5, when in this portrait week view, you instead get one color box for your 9am meeting and right next to it one for your 5pm. It's not trying to show you the shape of your day, it is successfully showing you whether your day is busy or not. Turn your iPhone to the side and into landscape view. Then you get the regular view of where your appointments are in the week and in the day. If you instead look at your week view on your iPad, Calendars 5 knows you have the room to see everything you need so it shows you this regular view in both portrait and landscape. The month view is similarly more for seeing how busy you are than for really knowing what you're doing every minute of the day. 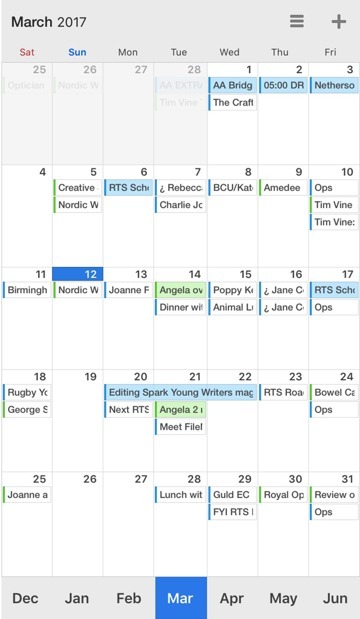 It's quite a crammed month view on the iPhone and gets more so if you also include To Do tasks synced from Apple's Reminders. However, one glance at the month view shows you immediately when your busiest and quietest times are. 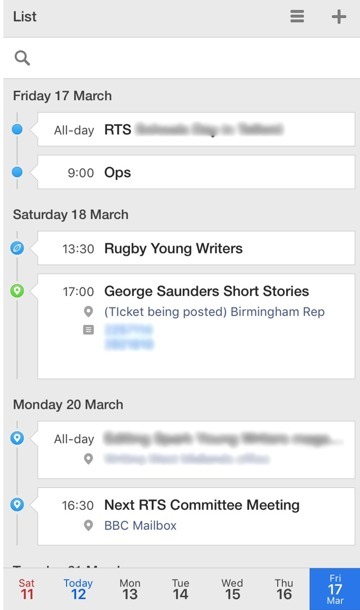 For any greater detail you can tap on an event to see a pop-up window with more. You can also pinch to zoom out and so focus your attention on a few days instead of the whole month but that's unsatisfactory. As you're pinching, the event titles grow larger but the moment you stop, they snap back to their original small size. So the day grid is bigger but the text in it is just as hard to read. You can think of the month view as really being like a heat map of your life and for actually working on events, you switch to other views. Arguably the most useful of these is the List view which is just a long, scrollable list of everything that's coming up for you. Still, switching from month to list view, day to week view and so on takes a couple of taps. Unlike other calendar apps, you have to tap to bring up the list of views and then tap again to choose which you want. By comparison, BusyCal keeps these options on screen all the time. Fantastical does not but it trains you to use certain swipe gestures to move between them. You'll find you have a preference —but there's also an argument that many of us stick with one view for most of the time. So continually displaying the choice of list, day, week and month takes space that could be used for your events. That natural language feature works very well: it makes entering a new appointment actually quick. What's more, it makes doing this feel even faster than it really is because you're not stopping to think. Rather than entering each detail like the start time into the right box, you just type it out the same way you would tell someone. You type it out the same way someone on the phone is saying it to you right now. Before you've hung up, it's in your calendar. It could be better: Fantastical visually shows you the impact of each word you type. So as soon as you type 'lunch', Fantastical will pop a one-hour blob in your calendar for today. Then when you've said 'next Wednesday', you see it jump the blob over there. That's not only more attractive than how Calendars 5 or, for instance, BusyCal does this, it also makes it substantially less likely that you'll make a mistake. Nonetheless, this natural language feature is a strong one for Calendars 5 and at the moment still puts it ahead of Apple's own Calendar - on iOS. Apple's Mac version does natural language well but it isn't on the iOS version. So Calendars 5 does bring something to the iPhone and iPad that Apple doesn't, but it surprisingly fails to support iOS features that would be particularly useful. Specifically, Calendars 5 can't be used in Split Screen. Consequently there is room for improvement in Calendars 6 or whatever the next version is called, but at the moment it is a strong calendar app. One thing to note is that as well as Calendars 5, there is an app by the same developer called Calendars. The firm, Readdle, doesn't even mention that one on its website yet it comes up at or near the top of the App Store when you search for Calendars 5. The un-numbered Calendars is a freemium version: you can try out some basic features and then pay in-app to upgrade to the full functions of Calendars 5. Ignore it. Just go straight to the full Calendars 5 right away —it is more than worth the money. Calendars 5 5.10.3 requires iOS 8.0 or higher and costs $6.99 on the App Store.